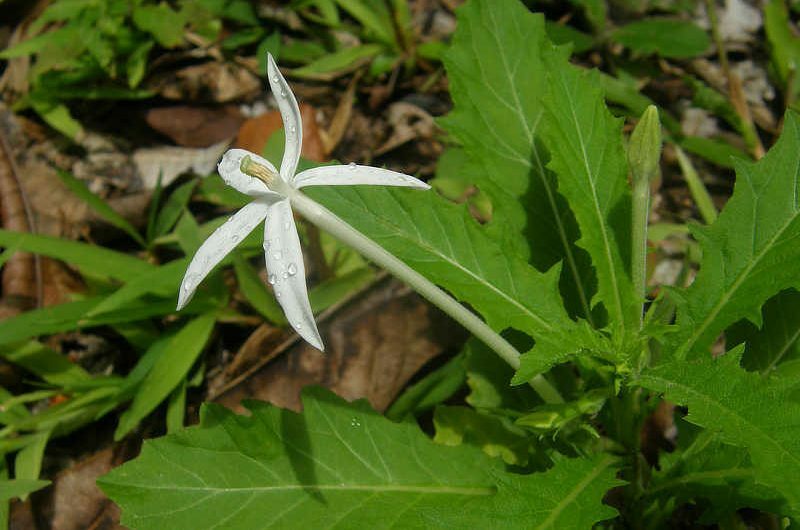 On the outside, this attractive perennial, with its long, snow-white, tubular flower and 5 petals arranged in the shape of a star against dark green leaves, is rather eye-catching. The thick, hairy leaves form a rosette, and are pinnately lobed. The fruit is a hairy green capsule containing tiny light-brown seeds. It stays close to the ground, reaching a height of 60 cm tall. However, on the inside, this pretty plant gives more bite than its pretty external appearance would suggest. One of its common names, “Madam Fate,” offers a warning. It is well-known for its concentrations of two powerful alkaloids, lobeline and nicotine, and if taken in high dosage, various effects including vomiting, trembling, irregular breathing, convulsions and paralysis can occur. Its milky white sap is a strong irritant, and can be absorbed through the skin, causing a burning sensation, and even just a drop or two of sap in the eye can cause blindness. On the other hand, in some cultures this plant is used for medicinal purposes, as it is applied to wounds to cauterize and promote healing, and has also been used to treat asthma, bronchitis, epilepsy and hydrophobia. This plant is native to the West Indies but has been widely introduced and is now common throughout the tropics and Oceania. It prefers moist, shady lowlands with moderate rainfall, and can be found around the Canopy Tower, Lodge and Camp.